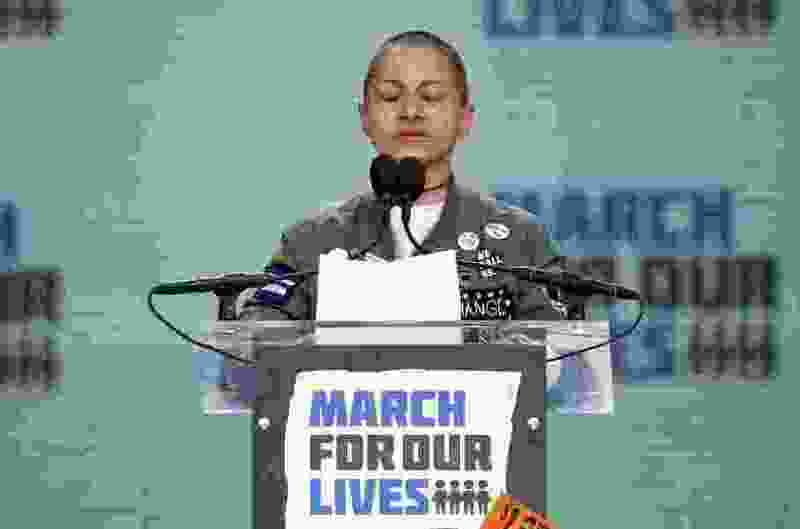 (Alex Brandon | The Associated Press) In this March 24, 2018 file photo, Emma Gonzalez, a survivor of the mass shooting at Marjory Stoneman Douglas High School in Parkland, Fla., closes her eyes and cries as she stands silently at the podium for the amount of time it took the Parkland shooter to go on his killing spree during the "March for Our Lives" rally in support of gun control in Washington. Last year’s shooting at a Florida high school sparked a movement among a younger generation angered by gun violence and set the stage for a significant shift in America’s gun politics. President Trump, again this year in his State of the Union address, attempted to hammer home his rhetoric that immigrants are a danger to our citizens by having present in the gallery the family of a Nevada couple murdered by an undocumented immigrant. Although I don’t want to take away the terrible loss to this family, Trump could have filled the gallery and overflowed into the halls of Congress if he had invited every family member of those killed by mass shootings by our native sons over the past few years. Included would be the 58 families from Las Vegas, 28 families from Sandy Hook, 17 families from Parkland High School, 26 families from First Baptist Church in Texas and nine families from Emanuel African Methodist Episcopal Church in Charleston. Reasonable gun control is the elephant in the room that Congress and the president choose to ignore. It would have been an opportunity for the president to set a national platform for reasonable gun control to help safeguard our schools, public spaces and religious communities. We need reasonable gun control in this country, not ongoing rhetoric attacking our immigrant neighbors.